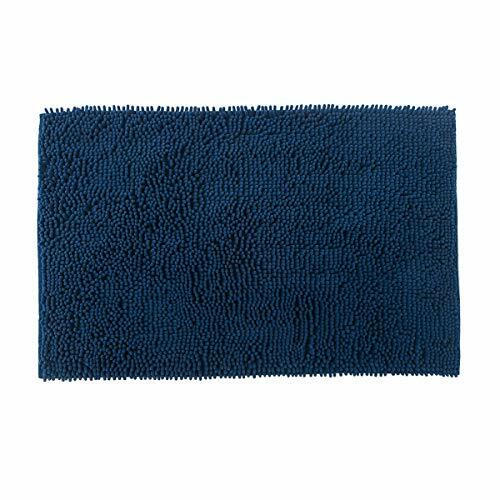 Famibay Bath Mat, Shaggy Chenille Bath Mat Microfiber Hotel Spa Bath Rug and Mat For Bathroom No slip Bath Tub and Shower High Absorbent Soft Large Accent Rugs, 23.6x35.4 Inches Navy by Famibay at My Natures Treasures. MPN: WXBZFAM-10237. Hurry! Limited time offer. Offer valid only while supplies last. Famibay Chenille Microfiber Bath Mat Famibay - The United States Trustworthy Brand. We have NOT AUTHORIZED any other sellers to sell our products. Famibay - The United States Trustworthy Brand. We have NOT AUTHORIZED any other sellers to sell our products. Famibay Allowed only. 100% super soft & shaggy chenille microfiber bath rug. The Famibay bath mat has lager size 23.6 X 35.4 Inch with 4 colors, which are perfect for a variety of occasions. NON skid and well absorbent, safety for your children/kids and elders. That will be a great and economical choice for your dorm room, home bathroom, or beauty care business. Size: 23.6 x 35.4 inch. Thank you for choosing our bath mat. Your satisfaction is our top priority, we want to make sure you are completely satisfied with the product you have purchased. If you have any issues, questions, or concerns, please contact us directly, we will try our best to resolve the issue ASAP. Materials: 100% super soft & shaggy chenille microfiber bath rug. This mat is crafted from thousands of long thick and velvety microfiber chenille. Provide the comfort and perfect feeling to your feet. It's also the best gift to your pets. Large Size and Multicolor: The Famibay bath mat has lager size 23.6 X 35.4 Inch. 4 colors which are perfect for a variety of occasions: bathrooms, toilet, shower, floor, kitchen. Super Absorbent: High Density and plushness microfiber have the super absorbent water after shower. The water which held in the mat will dry quickly, keeping away from any mildew or moldy, make your bathroom for maximum clean and refreshing. Non-Slip: With Hot Melt Adhesive backing, it helps keep mats firmly in place and do not slip even have the water on the floor. It is also more soft so that can be folded easily and machine washable. Wash Notice: Machine wash in cold water with mild detergent. Tumble dry on low setting, then Lay flat to dry. Stays the same and as new, after every wash. If you have any questions about this product by Famibay, contact us by completing and submitting the form below. If you are looking for a specif part number, please include it with your message.